The unrest is hitting the economy: hotel reservations are down, retailers are suffering, unsettling investors, and Total said some of its filling stations were running dry. France's Prime Minister met with opposition leaders on Monday as President Emmanuel Macron sought a way to defuse nationwide protests over high living costs that led to widespread rioting in Paris at the weekend and are hurting the economy. The "yellow vest" revolt caught Macron unawares when it erupted on Nov. 17 and poses a formidable challenge to the 40-year-old as he tries to counter a plunge in popularity over his economic reforms, which are seen as favouring the wealthy. 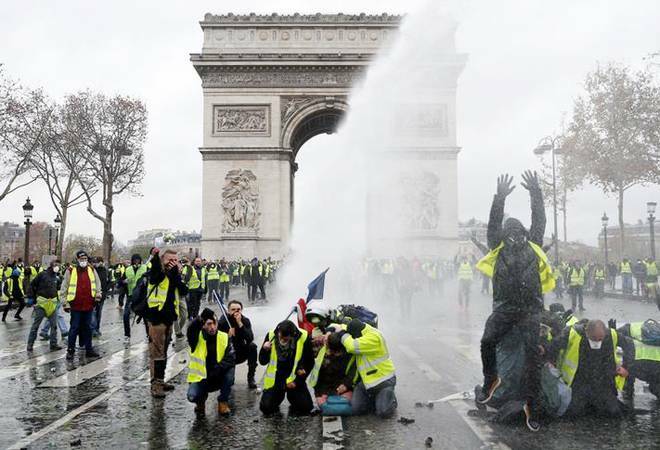 Riot police were overrun on Saturday as protesters wrought havoc in Paris's fanciest neighbourhoods, torching dozens of cars, looting boutiques and smashing up luxury private homes and cafes in the worst disturbances the capital has seen since 1968. Tourism and transport stocks fell in an otherwise buoyant market. Emerging from Prime Minister Edouard Philippe's office, opposition leader Laurent Wauquiez of the centre-right Les Republicains said the government failed to understand the depth of public anger. "The only outcome from this meeting was word of a debate in parliament," Wauquiez told reporters. "What we need are gestures that appease, and these must be born out of the one decision every Frenchman is waiting for: scrapping (fuel) tax hikes." The "yellow vest" movement, whose supporters cut across age, job profile and geographical region, began online as an impromptu rebellion against higher fuel prices but has morphed into a broader outpouring of anger over the squeeze that living costs are putting on middle-class household budgets. The movement's members come principally from the hard-pressed middle class and blue-collar workers living outside the big cities, but it also has more radical fringe elements. It has no clear leadership, making talks all the more complicated for the government. Their core demand is a freeze on further planned fuel tax increases - the next is due in January - and measures to bolster spending power. But they have also called for Macron to go, and many talk up the idea of revolution. The government is struggling for a way to engage. "Making a small gesture and then sweeping the problem under the carpet, just as has always been done for the last 30 years, does nothing to solve the deeper, structural problems," government spokesman Benjamin Griveaux told France Inter radio. Public support for the "yellow vests" remains high, with seven in 10 people backing their protest, a Harris Interactive opinion poll conducted after Saturday's unrest suggested. Macron says the fuel tax increases are part of his effort to combat climate change, wanting to persuade French drivers to exchange diesel-fuelled cars for less polluting models. He said on Saturday he would not deviate from his policy goals. As governments from around the world began a two-week conference in Poland to try to pin down measures to avert the most damaging consequences of global warming, the protests highlighted how costly some of those actions are likely to be. Christophe Chalencon, one of around eight semi-official spokespeople for the "yellow vests", told BFM TV he would not enter talks only to "negotiate over peanuts". The hitherto uncompromising response of Macron, a former investment banker, has only reinforced a view among the hard-pressed middle-class and blue-collar workers that he is part of an urban elite contemptuous of their world. The anti-establishment anger spurring the yellow vests on could spell trouble for Macron in next year's European elections. These are traditionally fertile ground for the far-right, led by Marine Le Pen, which already leads surveys of voting intentions. Saturday's unrest was the worst in central Paris since a student uprising five decades ago. At times, riot police appeared overwhelmed. The Arc de Triomphe, a unifying national monument that houses the tomb of the unknown soldier, was defaced, and a bust of national symbol Marianne was smashed.